Discussion in 'Overclocking & Cooling' started by chapplejc, Feb 5, 2019. I've got a Dan Cases A4 build on order with OcUK. It's just crossed my mind though I didn't really give a lot of thought about cooling vs noise. I'm really not up to speed at all with where we are with components these days so I just wanted to lay out what I've got on the table and my thoughts and see if anyone can give me some advice. The setup on order is a Ryzen 5 2600X with a Inno3D GTX 1070 on a Gigabyte B450 I Aorus board. The selected cooler for the CPU is the Cryorig C7 (the standard one, not the full copper one). The Dan case is obvs pretty compact and everything is relative, but everything I read suggests it does a pretty good job of venting and you can throw some pretty powerful hardware at it. My first question is - is the Cryorig C7 a good cooler? It seems pretty popular for this build? You can see the full list of supported coolers here. Does anyone have any experience of it? Is it effective? Is it loud? Etc. The other one I always see mentioned is the Noctua L9i/L9a. Any thoughts? I should really stress now I'm not going to taxing the system too hard - I mainly play RTS, strategy, city builder type games rather than FPS, although I do intend to get properly stuck into GTAV and RDR2 at some stage, and I'd like to get some pretty sweet visuals out of the games I do play at 1440p. So with that said, I doubt I'll be pushing the system to its absolute limit all that often, if at all. Therefore, second question - would it be worth downgrading my CPU a step to the plain Ryzen 5 2600 (65W) rather than the 2600X (95W)? Will that step in power/performance have a significant effect on heat, cooling, thermals, etc? Sorry to sound so utterly clueless! Your collective experience and wisdom here would be greatly appreciated . So excited to get my hands on it soonish. The 2600x should be a more highly binned 2600 so in theory it should actually run cooler at a given frequency compared to a 2600. Yeah, I would go for the copper one but it’s been out of stock for ages now. Again, excuse my ignorance, but ‘binned’? What does that mean? I’m sure you’re spot on, but how does a higher TDP, higher clocked CPU run cooler than the base model? Better binned silicon means that for a given frequency it requires less voltage and therefore puts out less heat. While you may never reach the top end of the turbo of a 2600x you may find that compared to a 2600 it runs cooler at a given frequency. But this is only a possibility - the 2600x should be better binned, but you would never know unless you had two side by side to compare. The C7 CU is listed as on order with caseking which is the parent company of OCUK. It may be worth asking in the customer support section of the forum when they expect to have stock at OCUK and at least register your interest. If it is only a few days / week away it would be worth waiting for to get more performance out of your CPU. Okay, is that some kind of quality control measure then? I.e. the 'better' / more expensive the chip, the higher grade (?) of silicon used? Re the C7, I'll do that. I know there's not masses of choice when it comes to low profile coolers, but is it worth considering any others like the Noctua ones? Imagine a cpu company makes 400 cpus that they then have to sell. They could test them, find the lowest common speed they all run at and then sell them all for the same price. Alternatively, they can test the cpus and sort them in terms of the quality of the silicon using (in this example) 4 bins. Bin A will be filled with the lowest quality silicon and that becomes the slowest performing CPUs, they are sold more cheaply. Say 75 at £50 They can run faster but to do so requires more voltage and produces more heat than the company is happy with. This binning process maximises the profit on the silicon by separating it into tiers that reflect the yield and quality. This is a very, very, loose definition of the binning process and it is far more involved and nuanced and takes into account other factors but hopefully you see that those in Bin A are there because they aren't capable of meeting the threshold for Bin B. While bin B could easily perform the same task as bin A but because the silicon quality is superior it should be able to do it more efficiently. This efficiency is also what allows it to surpass the Bin A silicon and run faster or whatever the criteria for bin b is. I'm sorry if i'm not being clear, like i said it is much more involved than that and really you don't need to worry about it. I only mentioned it because it is a quirk of the binning process that a faster higher TDP processor may actually run cooler than a slower lower TDP processor at a given frequency. I feel as though by mentioning it I have just made things more confusing but i think it is something that is overlooked when building a sff build and not using a low power part. Re. The Noctua coolers, it is certainly worth considering. I have one of my own and it is fantastic at what it does, though mine isn't a compact version like you are seeking. Generally Noctua build quality and ease of installation are excellent, so is their low noise. The looks leave something to be desired imo, but that may not be an issue. Cryorig C7 is probably the best in it's size group. Noctua NH-L9i is another option with almost identical cooling. I think Cryorig C7 is better cooler but Noctua has better fan. I think C7 with NF-A9x14 PWM fan would be ideal. Fan could be attached using zip-ties. Use 2 zip-ties for each corner with slip-tie end on one under cooler fins, zip-tie up through fins & fan and other slip-tie slipped on to lock in place. One zip-tie is bolt and other is nut slipped onto bolt. Hope that makes sense. Only down side of C7 is fan cannot be mounted pulling air up away for motherboard. I've found with low profile coolers if airflow is down the air above cooler is much warmer which results in higher CPU temps. The reason is fan pushes air down through cooler where it hits motherboard turning out, then hits RAM, GPU, etc. turning up along side of cooler and fan where fan then pull it back in and down through cooler. With fan pulling air out of cooler and away from motherboard airflows over motherboard to cooler then up through cooler & fan and on out of case. There are some aftermarket fan mounts for Cryorig C7 as well as some 3D printer programs to print your own fan mount. I've heard they work well. Thanks @Distracted, really appreciate the insight. I’m a techie at heart so I’ve been enjoyed getting back into PC tech in the last few weeks. Ta @doyll too, food for thought. I’m not in deep enough to go modding coolers if I’m honest. It’s going to have to be a straight call between the Cryorig and the Noctua I think. And I think I’d probably veer towards the quieter one if pushed, which I presume is the Noctua. The copper C7 though seems like an excellent unit. Argh. Decisions! Btw, there are two versions of the low-profile Noctua - the L9a and the L9i. So far as I can deduce, the L9a is an updated version for AM4 boards / CPUs. Is that right? In short, if I went for the Noctua, which one should I get? Derp, that makes sense . Thanks. Make sure you get an AM4 compatible one, or a bracket. Looks like they did update it! Yup, that’s what I spotted when I looked at the l9a on OcUK. So in fairly simple terms, it boils down to slightly better cooling but more noise with the C7 and vice versa with the l9a. And the sweet spot likely a Noctua fan bodged onto the C7. I've used C7 and the fan was not at all loud, quiet enough it's not audible in quiet room unless running stress tests. C7 vs C7 CU is only 2-4c difference, not worth the price difference in my opinion. Thanks @doyll. I’m going to go C7 and see what it’s like. It won’t cost much to switch if I fancy it further down the line. Hello again all. Got my system, very pleased, etc. The C7 though is loud and it is flush against the casing (yes, I know, I knew things would be tight in the Dan case). My CPU seems to fluctuate around the 36C to 42C mark idle, this is making the fan spin up and down a fair bit do I’m looking at a custom fan curve but I really don’t have much experience of setting them. I’ve got a Gigabyte Aorus board so I’ve downloaded the Smart Fan 5 software so I’m going to have a play with that. Ideally, I’d like it as near as damnit silent when I’m in Windows, watching YouTube, streaming, etc. I’ve seen others set a threshold of around 50C before cranking the fans up - presumably that’s pretty safe. Also, is it possible to make the spin up and down less sensitive? In short; if I just open Chrome, bam!, the fans are going. I’d really like it to take 5-6 mins before it makes that decision, just openimg the browser is hardly killer. Any thoughts? And is there other settings software I should look at? 5-6 minutes is too slow for a small cooler IMO. But yes, coolers ramping up and down almost based on load rather than temperature is annoying. It's down to thermal mass - a bigger lump of metal can store more energy before it gets 1° hotter. So a giant air cooler will take some seconds or minutes to get substantially warmer. Likewise a large mass of water and copper in a custom loop will take minutes or longer. So your cooler is probably closer to 10-30 seconds before you'd worry about substantial temperature increase. Still, a sensible fan curve will do wonders. If the system is checking temperatures and adjusting speeds every 2 seconds that should be ok. I personally use software called Speedfan but it's old and not compatible with a lot of newer hardware. It's got crazy levels of detailed control though. Just to check, I'm assuming the cooler application went ok - how are your actual load temperatures? The system was built by OcUK, not me. I'm therefore assuming it was done properly . I haven't actually tested it under load as again, I don't really know the best way because I've not really done any benchmarking, etc, for a long, long time. I looked into Speedfan but as you say, its pretty old now. 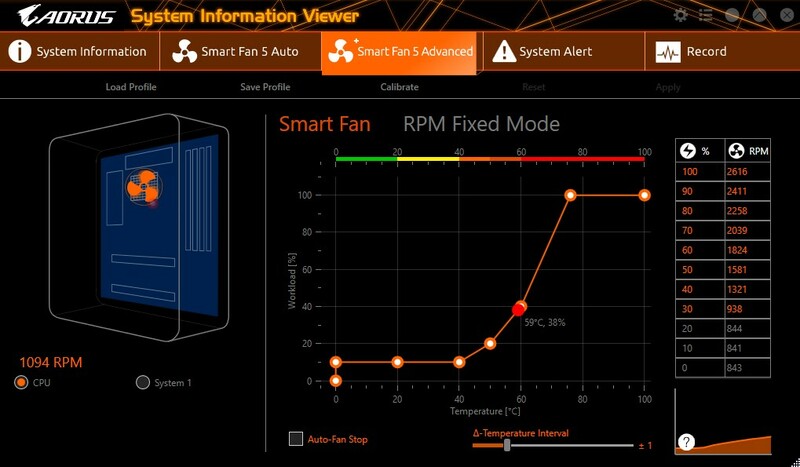 I'm using the Gigabyte / Aorus SmartFan utility atm. I've got my CPU fan curve set up as below. It's quite a good balance atm but I'd still really like to try and make it near silent in just about all uses except gaming. I expect below about 30% the fan will be spinning at minimum speed and any variation won't make a difference. Most fans given lower than about 30% PWM signal will default to a minimum speed rather than stop, it's worth figuring out what that speed/value is. Just so you can draw an accurate curve. I also wouldn't expect a small cooler in a tiny case to have "silent" in its vocabulary, but this is where experimentation is king. You're in the right place to try combinations of fan speeds, temps etc from that Aorus software Tuning up your fan curves and airflow is very rewarding but has to be done case by case. For benchmarking/stress testing I go pretty old school: Prime95 26.6 for CPU, Furmark for GPU. Be warned they generate maximum heat and fast. First see where temperatures max out, maybe read fan speeds at that temperature. Then you can make some tradeoffs of max temperature versus noise, etc. Personally I like a silent idle machine but if 5% extra fan speed will mean temperatures are that bit lower, it can be worth it. Especially if it means they ramp up less frequently - especially important to keep case airflow good for that reason. A lot of people including myself switched the cryorig fan with the noctua 92mm slim. It was still audible but not as bad as the stock cryorig fan. The cooltek lp53 + noctua slim 92mm is another option but you will have to import it. Costs around £50 for the cooler. It gave me the best results. You can also get a 92mm AIO (asetek 545 clc) it will have to be a 2nd hand unit since they don't make them anymore. Alpenfohn Black Ridge was designed for the DAN case in mind but was recalled. Might be worth asking support if they are coming back.